Being able to game with people that started as friends that I’ve known for a while, and I now consider as family. Basically, some of the leaders that I had were not strong leaders and didn’t care about the community. I wanted to show that I cared about the community and that I could to help and grow XG. Has anything in the community impacted your real life? Or vice versa? It has helped me be better as far as social interaction in real life. Yoshi’s Island on the Super Nintendo. Chinese food – peppered steak & onion with fried rice. After I came back from my three month break and into .Com, I had a lot of people who talked to me saying that when I was general of Adrenaline, they could come to me to help with issues and they thought I would be a great section leader, so I pushed myself to get there. Hard work and dedication, and always work together with your peers. If it gets too stressful, use your chain of command and reach out to those above you for help. Being able to work with the other two divisions to make sure that the whole community is solid, as well as being able to work with the XCs and XIs to continually improve the community. I would change the way government is with housing for its citizens. If people can’t afford it, they should be willing to give assistance to them because supporting a family can be hard. “Looks like a party.” Maybe he’s looking for tacos? 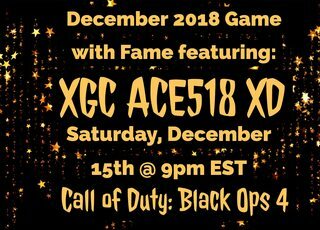 To learn more about the Sea of Thieves adventurer, join XGC Buffy XS in the Game with Fame Game Night!